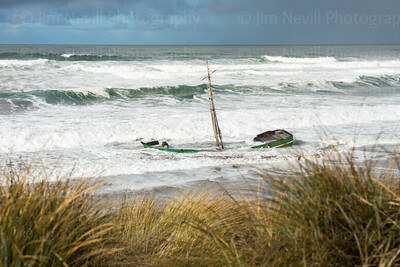 Shipwreck "Verna A II" in Bodega Bay, CA gets covered by waves during a full moon king tide, medium sized swell and severe flooding resulting from the storms of early January 2017. Along the northern Mendocino coast sits this awesome arch. 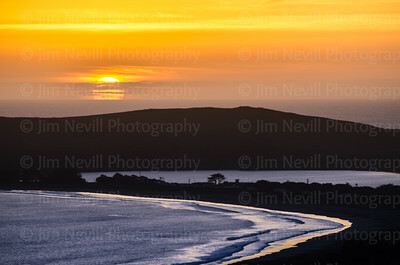 I've spend lots of times on this particular beach for various aquatic sporting activities but always seemed to fail having my camera nearby. Not this time, when the sunset so perfectly peeked through the archway, giving us that awesome and dramatic glow. As a side note, only a few moments after this photo was taken a big sleeper wave came in fast and had it's way with my tripod, breaking a carbon fiber leg in half while I held my camera over my head. Good times. 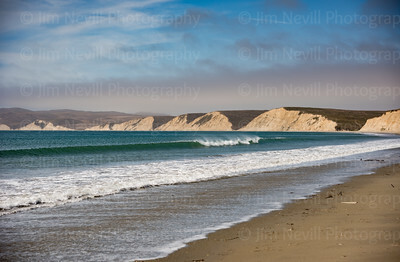 Drakes Bay, Point Reyes National Seashore, Marin, CA. During his circumnavigation of the world, English seaman Francis Drake anchors here and claims the territory for Queen Elizabeth I. Calling the land “Nova Albion,” Drake remained on the California coast for a month to make repairs to his ship, the Golden Hind, and prepare for his westward crossing of the Pacific Ocean. There are times when I hear photographic lessons I have learned echoing in my head. One of the primary lessons is that lighting matters, in many cases more-so than the subject itself, no matter how attractive. The angle of the light specifically is how we create threedimensionality, the sense of seeing an image as an object in space, not projected on a flat surface. By casting deeper and longer shadows, we can use nature to create the sense of volume. In the case of this image, the same scene shot during poor or overhead light would have resulted in a rather uninteresting shot. With great afternoon light however, the scene jumped to life and told the real story about the the ocean's interaction with the shoreline. Photography is as much about composition and lighting as it is timing. Sunsets present a particularly fun challenge because you are trying to get a glimpse of the sun just as it greets the horizon line, a moment which only last seconds and most often is obscured by fog. I would estimate that my usable vs unusable ratio is 1:25, only getting what I consider a fine art quality shot one out of every twenty five attempts. On this particular evening a dense cloud cover stretched all the way to the horizon, but left a peek hole where it met the ocean. I had not intended on capturing a starburst shot this night but with the natural filtering effect of that small window in the clouds the moment begged for it. Shot soon after first light on Thanksgiving Day 2013 in Northern California, this warm and rugged scene accents the fall colors, the transition of the seasons and the raw beauty of this region. By day you would walk right past this rather beat-up looking and broken down dock. At dusk on a calm night, very different story. For locals living in Bodega Bay, driving on Highway One past this scene is a daily undertaking. Most days it's cold, foggy and windy here but there are certainly a fair share of pristine, 'worth the wait' moments like this as well. 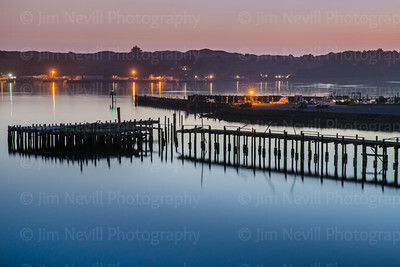 In this photograph are three dimensions of dock life: past, present and future. 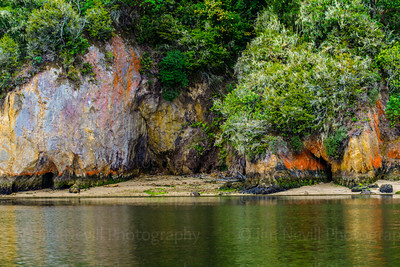 Tomales Bay, CA - near Heart's Desire Beach sits this standout rock formation. I caught it at minus-low tide and the color scheme was amazing. 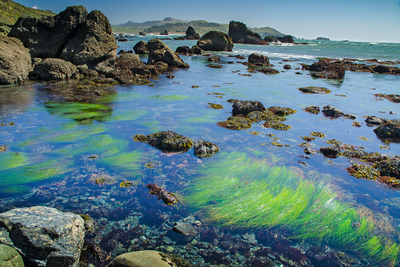 Algae, mineral drip, seaweed and who know's what else formed this rainbow. Coastal California has hundreds of miles of undeveloped ranch lands, preserved as open space and host to grazing animals like cows, sheep, goats and all the wildlife that pristine pasture like this offers. I composed this shot with the barbed ranch fence to tell the juxtaposed story of confined freedom. Driving down Highway One in CA you’ll pass all kinds of beautiful landmarks and natural vistas. 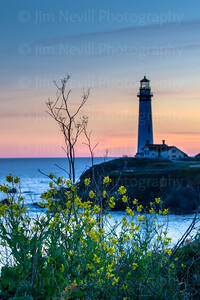 Just north of Santa Cruz is the Pigeon Point Lighthouse. It’s 115 feet tall and was built in 1872. It used to assist passing ships with a 5 wick lard oil lamp reflected through 1000+ prisms. Today it is still an active US Coast Guard lighthouse but uses a modern “Aero Beacon” for lighting. In addition to lighting the way – this facility also offers an international hostel with a hot tub. Reservations can be made online. 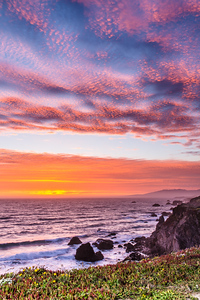 Just over the Mendocino County line, on the drive north toward protected surf breaks and coveted abalone dive sights, Highway One leads through the quaint coastal town of Gualala, CA. This beautiful village is a perfect stop for impressive scenery like this, top notch "Bones" BBQ, Pete's Coffee at the Surf Supermarket or a smoothie from "Trinks" cafe. 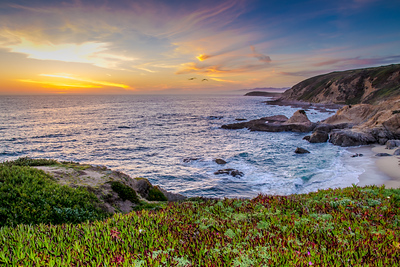 Taken at the Bodega Head whale watch overlook, this sunset photo makes you feel like you are wrapped in a blanket with your significant other savoring the moment when the sun meets the horizon. 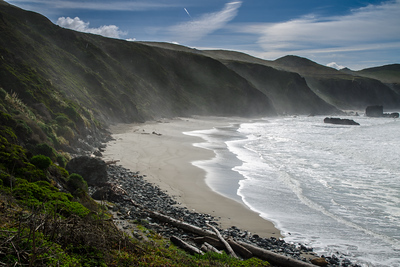 Uncork your glass of Sonoma County chardonnay and revel in the serenity of the mighty Pacific Coast. On any given day in countless places on the Sonoma coast you get this if you are willing to walk a few clicks from the trailhead. 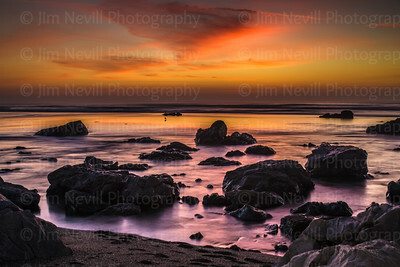 If you were on the Sonoma Coast on 1/4/15, you were treated to this awesome sunset. As a landscape photographer I seek out many things in order to make a great photograph but basically my formula is a trifecta which includes good lighting, an interesting subject and calm winds. Every once in a while nature provides everything I could hope for and much more which leads to special, one of a kind moments like this. This night, the trifecta was present but added to it was a very low tide creating a highly reflective wet sand, a large flushing intertidal pool, a cool cloud structure and even a bird standing still in the distance. My wife and kids were with me too which made it an over the top Pacific sunset. The sunsets we have here in Sonoma County are among the best. Late winter, early spring colors signal the change is seasons. (Taken July 4, 2015) - Not many days go by that I don't think about how fortunate to live in Northern California. My wife's father grew up just up the block from here and once a year is an annual family reunion that has been held almost every years since the 1940's. After a day of chatting it up with the old timers my wife, kids and I went to take a stroll on the beach and this happened. The driftwood in the foreground is most likely an old growth redwood tree which now sits extremely high above the high tide line, indicating the massive oceanfront storm that must have driven it here so long ago. 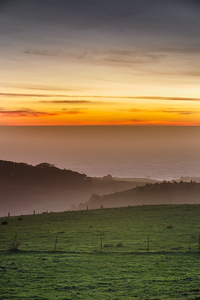 This photograph highlights the simple and soft colors of a Pacific coast pasture at sunset. The rolling hills, freshly green from winter rains stretch only a few miles until they reach the Sonoma coastline. The fog that partially fills in the valleys gives a good sense of distance and tranquility. 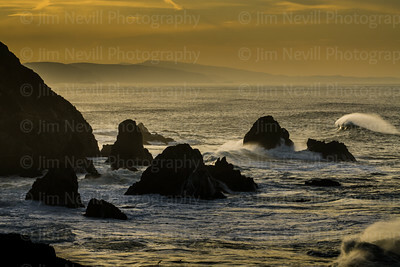 A long exposure taken of a rocky outcropping in Northern California. The arriving south swell from hurricane Marie in August 2014 was pounding the shores, creating the tidal cascades across the mussel colony. The photo faces due west towards the open Pacific ocean where you see a fishing vessel heading back into port. 2:1 Panoramic Ratio. 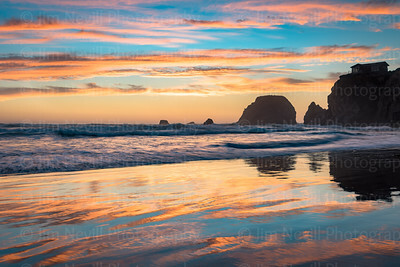 I live only a few miles from the Sonoma Coast in Northern California and when the clouds are building (or dissipating) throughout the day, I get a pretty good idea when a pretty sunset is upon us. This night I loaded up my kids and drove to a few spots I thought might capture the polka dotted colors - but never expected a scene quite this beautiful. Passing Storm at Goat Rock State Beach is a very detailed image of that perfect moment when the storm passes, the sun pops out and the raindrops are still trickling through the shot. In the foreground you see Doran Park, a campground and man made sandpit that houses the Bodega Bay Coast Guard Station. The watch overlook is located in the center near the lone cypress tree. In the distance is Bodega Bay, Bodega Head and of course the Pacific Ocean.